Launceston director of rugby Neil Bayliss says his side must look at their discipline after their 23-20 loss at Taunton in National Two South. His side led 14-3 at half time but had two players sin-binned as the hosts came back to inflict an eighth loss by four points or fewer this season. "We had a few yellow cards again, which is obviously an issue which we've got to address," Bayliss told BBC Cornwall. "They snuck it at the end, but the spirit is not to be faulted." 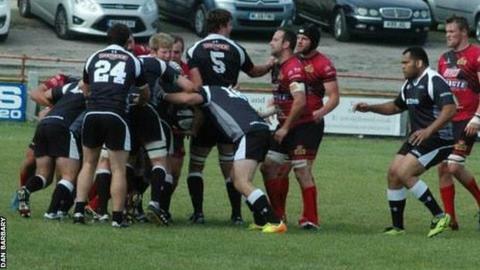 The loss meant Launceston slipped to 11th in National Two South, one place and two points behind Cornish rivals Redruth, who they play at Polson Bridge on Saturday. "It's something we've got to look at, it's the referee's interpretation and he's obviously right at the end of the day," Bayliss said of his side conceding so many penalties. "Sometimes you do have to question in your own head what he's given these penalties and yellow cards for, but that's part and parcel of rugby. "We've got to look at it, work on it, and put it right next week."